Help US troops/veterans/their families. Assist disabled vets/family members; financial assistance; educational scholarships; VA claims assistance; mental health/suicide prevention outreach; phone connections home. VFW affiliation/membership not required. Michael Ward of Sacramento, Ca., has lived a full life with the military. He's been a part of the Marine Corps, Army and Army National Guard. He and his wife, Elaina are the proud parents of four children. Ward was serving in Iraq when his group came under enemy fire. "I was blown from my truck, and hit my head on a rock. The attack was surreal ? it felt like I was in a movie." He joined the military to better his life and provide for his family. He'd been a dedicated recruiter, sergeant and manager of aviation supply, transportation and logistics. Ward returned home after serving with pride for 16 years with a disability rating of 100%. After mistreatment by a rental property manager, the fear of not being able to adequately house his family became a serious reality. "I simply couldn't believe my family and I were facing homelessness. It wasn't right." Ward visited a local Veterans Resource Center where he was informed he may qualify for a VFW Unmet Needs grant. He filled out the information online, and soon received a call from the VFW. "They were really supportive. It felt really good to find veterans who assist other veterans. The staff member I worked with was a real lifesaver, and a blessing to my family and me," he said. The Wards received a grant which covered hotel costs while they found a suitable home for their family. Ward witnesses a lot of homeless service personnel in his area and he stresses the importance of funding the VFW's greatly needed services. "Hats off to the VFW. They were so patient and helpful. I don't think I would have made it without them." Support U.S. service members, veterans and their families! 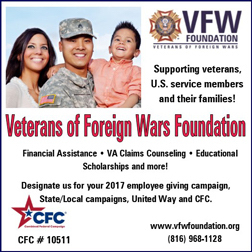 Support VFW programs for U.S. service members, veterans and their families, i.e., 1) Financial assistance for housing, utilities, vehicle payments, repairs, etc., 2) Scholarships for student veterans, 3) Welcome home and send-off events for military units, 4) VA medical claims representation; all at no charge to the veterans and military families. Visit our website or pledge your support NOW!